Baggage carousel sounds a lot more fun than it really is. We have all seen the three-letter airport codes used for baggage sorting. It is easy to understand the logic behind using MIA for Miami, DFW for Dallas-Fort Worth, and SEA for Seattle-Tacoma. But how did the powers that be decide which California city gets the code SAN? And should I take it personally that my Fresno-bound bag is tagged FAT? 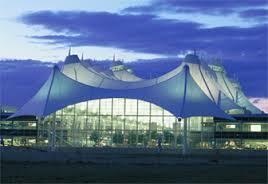 The new Denver International Airport is officially DIA but is better known by the city code DEN. There is a wealth of confusion and trivia treasure possible in airport codes. Can you match these three letter codes with the appropriate reference to the city, namesake or history? Try your hand at combining these lists, then pick up additional commentary in the paragraphs below. A. Best known by its WW II flying ace namesake, retains its Orchard field code name. J. Originally Sunset Field, later named for Harold Geiger, where is it? M. The obvious choice NEW was already allotted to another airfield. Now it honors a musician. I will offer the answer key and additional details below, but I wanted to allow space for you to answer without cheating. In the meantime, consider why there are so few airports (any?) named for women. Military aviators and elected officials are honored more often than other celebrities, so men are more often represented. Outside the US, Caribbean airports are named for Dutch royalty — Princess Juliana in St. Maarten (SXM) and Queen Beatrix in Aruba (AUA). Elected women are best represented by Indira Gandhi Airport in Delhi, but I don’t know of any elected women who have US airports named for them. Our prime aviatrix Amelia Earhart has been honored only by a tiny civic airport in her hometown Atchison KS. Okay, pencils down. How did you do on the matching quiz? Here are the answers. 1H, 2F, 3I, 4J, 5K. 6E, 7B, 8L, 9C, 10M, 11A, 12D, 13G. I expect some of these still leave you scratching your heads. Here are some explanations to clarify the mysteries. For even more details, see www.Wikipedia.org. BUR – Burbank CA, now honors Bob Hope. Other previous names honor Lockheed and United Airlines. BWI – Thurgood Marshall Airport honors that Baltimore native, the first African American to serve on the US Supreme Court. DCA – in the District of Columbia, now Ronald Reagan Washington National Airport. GEG – Spokane WA honors Major Harold Geiger, an Army aviation pioneer who died in a crash in 1927. IAD – Dulles International Airport, west of Washington DC. IAH – Houston’s larger, international airport. The smaller one, Hobby, retains the city code (HOU). JFK – John F Kennedy Airport, New York’s busiest. LGA – nearby hub named for Fiorello LaGuardia. MKE – Milwaukee. Billy Mitchell was a flying ace and a hero — until he was court martialed for criticizing superiors for not using air power to its potential. MSY – New Orleans! Go figure. Daredevil aviator John Moisant died in 1910 in an airplane crash on agricultural land where the airport is now located. The code MSY was derived from Moisant Stock Yards which the airport displaced. Lakefront Airport retained the city’s code NEW. Now MSY is called Louis Armstrong New Orleans International Airport. ORD – Chicago’s largest airport honors amazing WW II ace Edward Henry “Butch” O’Hare. His father was Al Capone’s lawyer until he turned state’s evidence. 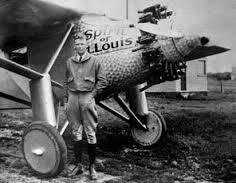 Wouldn’t you think Charles Lindbergh would be remembered in St. Louis? Guess again. SAN – Lindbergh picked up his plane in San Diego and flew it across the US before attempting the Atlantic crossing that made him famous. Meanwhile St. Louis’ airport (STL) is named Lambert Field, also an interesting story. SNA – Initials come from the city location, Santa Ana. There are many stories buried in airport codes . I apologize if I omitted or didn’t do justice to your favorite. Do follow-up in Wikipedia if you want more information. A travel agent since 1994, I want people to get together for greater understanding across boundaries. This entry was posted in Travel, Uncategorized and tagged airport, airport codes, Amelia Earhart, Charles Lindbergh, IATA, JFK, O'Hare, San Diego, travel. Bookmark the permalink.